Flanagan Motors Mazda is proud to offer the best local deals on a wide variety of pre-owned and new Mazda vehicles. Our Missoula Mazda dealership is where you will find all the latest exciting Mazda SUVs, sedans, and sports cars. One model we are excited about is the 2018 Mazda CX-5, a sleek and thrilling crossover SUV that provides all you need for your next adventure. Come stop by our Mazda dealership near Helena, MT today to experience the 2018 Mazda CX-5 in person and to set up a test drive. As an ideally sized SUV for rugged exploration and everyday commuting, the Mazda CX-5 seats five comfortably with plenty of room for cargo. The available AWD gives the Mazda CX-5 confident capability on off-road terrain and harsh weather conditions. 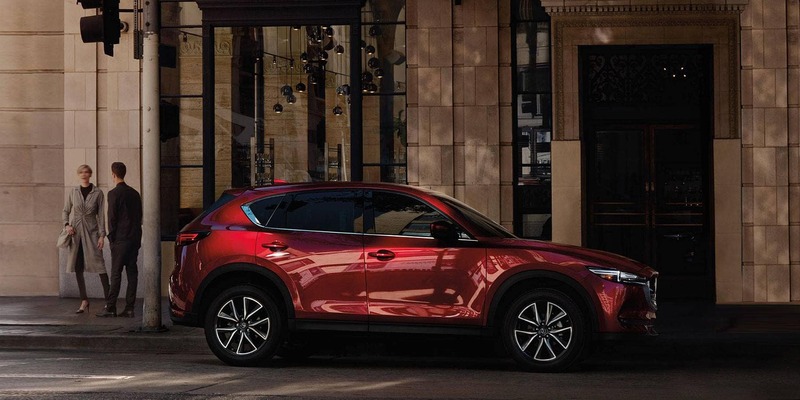 The 2018 Mazda CX-5 is powered by a 2.5L 4-cylinder engine that produces 187 hp and 186 lb-ft of torque, giving it plenty of power for responsive acceleration. There are three trim levels of the 2018 Mazda CX-5, each offering added exciting features. The bold and refined exterior design will have you looking back at your SUV each time you walk away from it. The interior features similar elegance, with comfortable seating and sleek design cues that create a great environment in the cabin. The exceptional handling and smooth suspension help complete the amazing driving experience that each passenger will enjoy. We feel confident in your safety when you drive off from our Missoula Mazda dealership in the 2018 Mazda CX-5 thanks to the abundance of standard and available safety features. The available i-ACTIV AWD® system uses smart technology to predict when all-wheel drive will be needed by monitoring things such as outside temperature and your driving patterns. The available i-ACTIVSENSE® system uses cameras and radar to alert you of potential collisions from all angles, including blind-spot monitoring and alerts. Pre-collision technology helps to reduce the severity of unavoidable impacts. When you visit our Missoula, MT Mazda dealership, located at 1776 Stephens Ave, you can expect only the best customer service. Our helpful staff can walk with you through each step of the buying process, including financing a Mazda vehicle, selecting your trim, and setting up a test drive. Come see us at our Mazda dealership near Helena today.